Ray Bird – bandleader, dancer, actor, radio announcer, writer, and toastmaster. Ray’s was sent to Bowen by his parents to keep his aunt company while her husband and son were away at the war. His aunt, Ann Delany was the pianist and leader of the Excelsior Dance Orchestra in Bowen. Ann tried to teach Ray the piano but he would not practice scales so she refused to continue but as there was no one to play drums after the band’s drummer went off to war, Ray took music and percussion lessons and in 1941 at the age of 13, became the drummer with the Excelsior Dance Orchestra for the Saturday night dances in Bowen. His aunt then started a Thursday night dance to raise funds for the Red Cross. Ray joined the Bowen Municipal Brass Band, and travelled from Proserpine to Ayr. Soon after he was invited to sing at the local charity concerts. If he was going to continue singing he would need a pair of long trousers which would be is first. So he went busking with the saxophone player from the band. He struck a deal with his school. Five shillings each with a promise to his school break-up Committee, of everything he earned over that he would donate to them, provided they spread the word and supported him. Ray got his long pants, the saxophone player his five shillings, and the committee received seven shillings and six pence. He soon rounded up other youngsters to sing dance or perform in some way at the concerts. Ray was all of fifteen years by now. There were not many adults available at the time. The concerts kept going until it was time just before the end of the war in 1945 for Ray to return home to his family in Townsville. He soon joined a dance band Scotty Dempster’s Serenaders and played at the Suburban Bowls Club Hall every Friday and Saturday night, and at the age of sixteen began making a name for himself in the music business in Townsville. He was noticed by the Bill Tinker Orchestra, the Band of the moment and was invited to “sit-in” for a couple of nights. Those couple of nights lasted six or seven years. At 25yrs Ray then formed his own band, Ray Bird’s Rhythm Dance Orchestra which played for Balls and dances throughout North Queensland from Bowen to Tully and became one of the top bands in Townsville at a time when dances were held almost every night of the week. Ray attended the Ann Roberts Ballroom Dance studio for dance lessons and became very serious about dancing. In 1957, with his dance partner Miss Una Nelson, Ray won the North Queensland Ballroom Dancing Championships. Later, wanting to share what he had learnt from Ann Roberts he became a partner in the Pat Pacey Ballroom Dance Studio. He then encouraged young people everywhere to learn the basics of this important form of entertainment. Where ever the Ray Bird band played couples young and old were encouraged to demonstrate their skills of the dance. During his spare time, Ray joined an organisation where they fed, clothed, and councilled the homeless. On a roster basis at “Osram House” they would give voluntary time after work, seven days a week from 5-7pm to work the kitchen, the clothing store, and seek donations. On Thursday nights they would visit the hospital to talk with the sick, offer a book, and run messages to the store. He stayed with that group from 1950-1961. Ray, in his belief that everybody has a talent no matter what their background started a Sunday night concert group, nobody had any experience which they were reminded of from time to time but charities and schools would benefit. It wasn’t long before Ray formed the Ray Bird Rhythm Revue Group. They travelled to Charters Towers, Ingham, Tully, and Ayr, and with an annual visit to Eventide Home. Ray wrote, directed, and performed in the revues “Night and Day”, “Laugh at the World”, and “Misty Mischief”. During his spare time Ray formed a cricket team for past students of his old school St Frances in Railway Estate, the equipment was paid for by the concerts he organised on Sunday nights at the school featuring the Rhythm Revue Group. He then became interested in drama and in the first North Queensland Drama Festival in 1961 he won the Best Actor Award with the entry “The Pioneers”. He went on to play the lead in the 3-act plays such as “Shining Hour”, the “Wjite Sheep of the Family”, and many others. He directed the 3-act play “Dear Delinquent”, and in 1964 he wrote the 3-act Drama for Townsville’s centenary entitled the “Pendulum of Fate”. His acting took him to Brisbane under the guidance of popular Brisbane Repertory Theatre director Babett Stephens, and for his performance in “Dinner at Eight” he received a standing ovation at Albert Hall. In Sydney, Ray played in “Inherit the Wind”, One Day of the Year”, and “Romanoff and Juliet”. However, despite offers to stay and work in Sydney, Ray was not prepared to live anywhere else but Townsville. Ray returned to Townsville and did radio drama such as “My Tale Is Told”, “Mr Brown”, and “The Wisdom’ for the ABC with the Australian Director of Drama Mr Robert Cubage. He took up his theatre career again with such plays as “Witness For The Prosecution” a season of one act plays for students and such musicals as “Maid of the Mountain”, and “Annie Get Your Gun”. Ray won yet another award, this time Townsville Best Actor Award at the 1968 North Queensland Drama Festival for his portrayal of John Lewis Carlino’s “Dirty Old Man”. Ray had a long stint as an announcer on radio station 4T0 where he developed a strong following and stayed until after Cyclone Athea. Ray was in demand as a compare for charity and he compared numerous functions and fundraising events always refusing to accept a fee. He wrote articles regularly for a Sydney magazine. They were about North Queensland and his columns were titled “On Stage with Ray Bird”, and “Dance with Ray”. In 1968, Ray joined Toastmasters International and he received many awards including the prestigious President’s Award which he received in person from the Toastmaster International American President. After a long break from acting, Ray returned to the stage in 1980 as Lillyvick, in the production of Nicholas Nickleby which opened at the Townsville Civic Theatre on Thursday 22 July with the first part at 6.30pm. The second part was on at 6.30pm on Friday 23rd July, and both parts were played on Saturday 24th July with the first part at 2.00pm and the second part at 7.00pm. On Saturday ?? 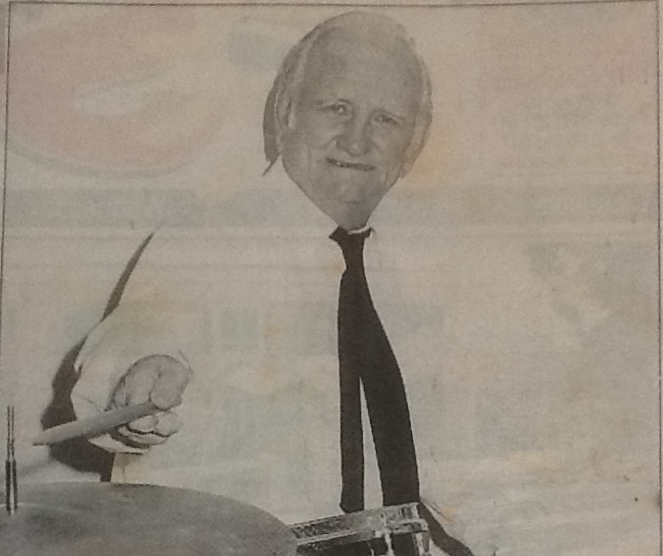 July 1996 as a tribute to fellow musicians and a big “thank you” to the dancing public, Ray with Les Nicholson of the famous Stokes-Nicholson Big Band organised a musical night of memories which would also pay tribute to Roy Stokes. The two bands that played at the “Nostalgia Ball” at the Ignatius Park College Hall were the Stokes-Nicholson Big Band and Ray revamped his dance orchestra to play with Ray on drums, Red Huxley on bass, Keith Mendo on trumpet, Bobby Passmore on sax, and it was no accident that Grace Newman an old and dear friend at the age of 83 was at the piano. The successful, much talked about “Nostalgia Ball”, where guests danced to the old favourites of the fifties and sixties, has been hailed by most as one of the “Entertainment Highlights of the year. In 1997 Ray was awarded a Lifetime Achievement Award by the Townsville City Council. Ray Bird retired at aged 69, although he still called Bingo for the gang on Monday nights. Ray passed away in February 2015.